If you have a Bangalore based grandmother or mother who bakes, you are no stranger to Adams! This almost century-old store established in 1920 specializes in bake-ware, bakery equipment, hospitality needs, crockery and cutlery among other things. Located amidst the chaos of a typical wholesale market place, close to Russel Market, tucked away is this shop. I have been here long ago, but never really had an opportunity to go with my camera in hand and some time to browse in relative leisure! It can be quite a task to find parking space on the lane opposite to Richards Square. If you choose to go you go on a Friday, even tough! Richards Square has little shops selling old fashioned charcoal grillls and other metal and plastic stuff. I always stop to take a look at the grills and wish I had the space to accommodate one. The shop right ahead is the shop you are looking for! The store has two levels and before you proceed upstairs, you may want to stop to check some ramekins. Haven't some of us been looking for these since ages? They come in quite a few sizes and shapes, from 1/4 cup (60 ml approx) to 1 cup (240 ml) and much bigger ones too. I got a few 60 ml ones in white as I thought they are just the right serving size for my pots de creme or creme brulee. If they do not have the size you want, you can request them to get them for you. You can get blowtorches (some 850 Rs for a basic low-tech one, wow!! 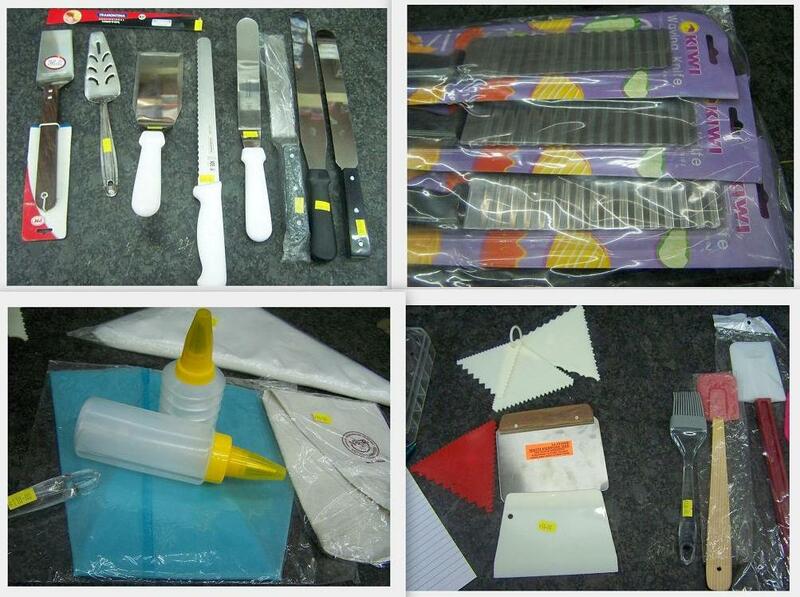 ), double boilers, silicon mats, cake stencils, pasta machines too, told the sales person. So do absolutely try for these here. 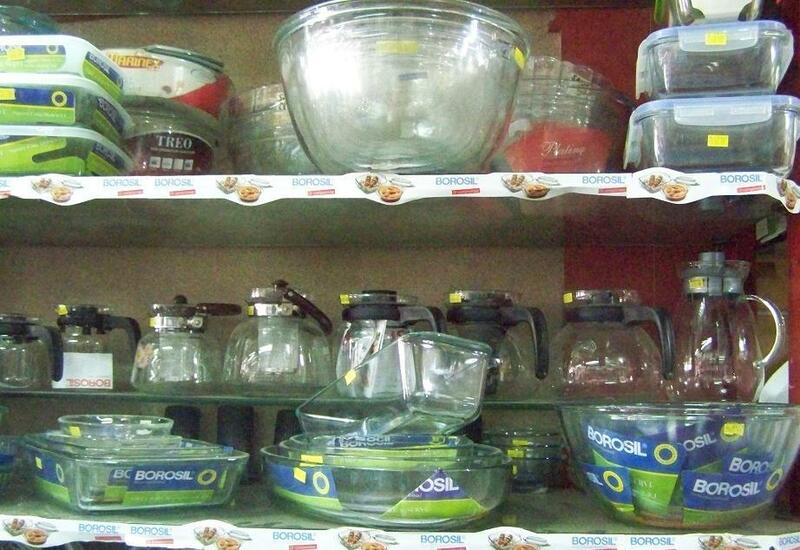 Glassware for your trifles, puddings, microwave cakes and desserts. While you are here, take a look at the spatulas and the silcion brishes and pick up some longish wooden skewers too. Handy for using as a cake tester for tall cakes. And some more beauties in white for your food pictures. 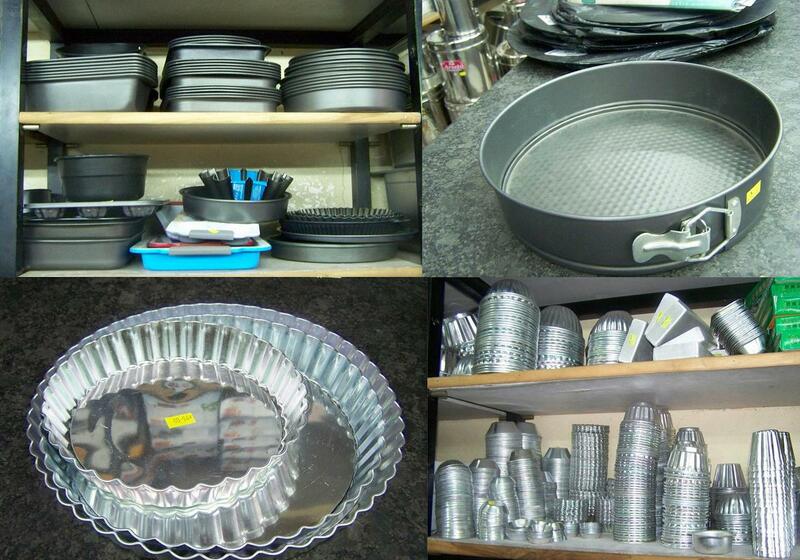 Moving upstairs, we have a whole lot of baking tins! Reasonably priced heavy duty square pans (about 200 Rs for the 8'' and 9'' square ones), mini decorative (not exactly bundt shape) cup cake tray, regular and non- sticks loaf pans (they may not be standard size, do measure), pie tins, mini pie /tart tins, little metal molds (for mini cakes, muffins), brioche moulds and springform tins. This huge wire whisk can be really useful for mixing chiffon cake batter, mixing large quantities of muffin, brownie batters ..till we get our Kitchen Aid mixers ladies! Dessert rings on the right, the ones on the left...don't recall! Can you tell me? and other regular baking supplies. They have some stylish storage glassware, copper serving kadhais and more! So do go at leisure and browse. 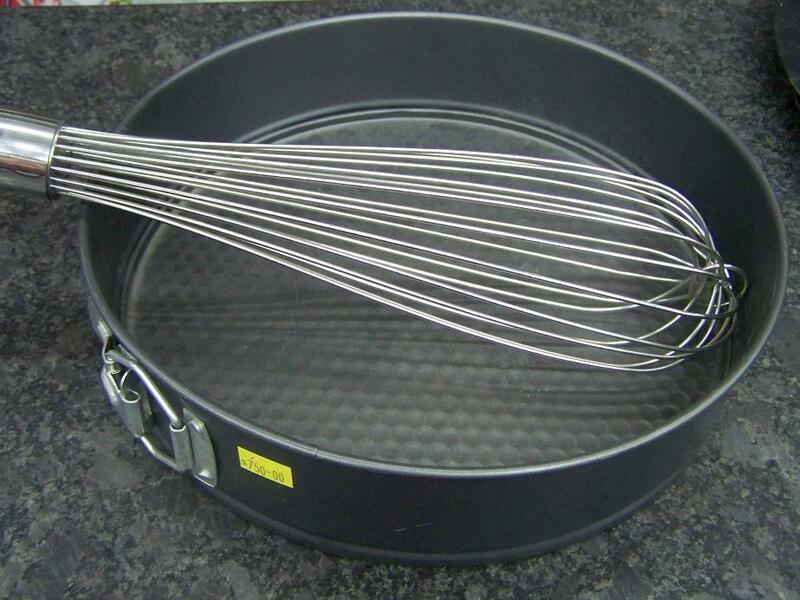 They home-deliver and also try to procure most metal bake-ware according to specifications...this I think is fantastic!! They have a lot more products listed on their website. The salespeople say they have or can get all the things listed there. I was again in a rush to come back before my kids arrived, so I could not stop to browse more. You can reach Shivajinagar Bus terminus and ask for Richards Square. What a visual treat to a baker!! And those Ramekins...truly have been looking for it all over. Sigh! If only I was in Bangalore! A store of my dreams ...wow! Hi, I am reading your blog from long time, though i won't bake/cook things . Because of your blog now i want to try my hand at baking. So for starters what is the best oven. Though i read your earlier post about baking essentials i am still clue less. make tiny tiny simple cakes. Yes i am pretty much illiterate in cooking. Wow,love to get some baking tools from there, seriously love that wooden pizza serving platter there. Dream shop.I will be lost in it. Another super useful post...I had picked up some stuff from here about 3 years back..If you go shopping this May, I am tagging along, will be in Bangalore soon...yaaay ! Superb work by you again Suma. Applauds for putting another baking shop discovery (at least for me!) in Bangalore. Any clue how much the ramekin, the 60 ml one cost? I recently bought 2 at 300 bucks from Jamaals, wondering if I should have waited. @MD - I think it was some 75-80 Rs..
Suma, this post is like un-earthing a treasure...to dash for. I am counting days for the summer vacation to get over so I can pack off my kid to school and get to this place (not like I wasn't otherwise), this makes each passing day even longer. As always your posts have been "just go for it !"..... and I can't keep wondering how you are able to manage time blogging such wonderful posts with kids vacation time. Kudos to your spirit !! Thanks for the information.. I have searched a lot for some bakeware, when in bangalore..
You should also check out www.mirascakeart.com, they have all these supplies on their website n ship throughout India. Call them n they'll find you the items that arent even on their website and ship them to you. Oh my myyyy!! I need to go there!! Hi I am Meera from b'lore. This is amazing. Thank you for this information. I am going very soon. 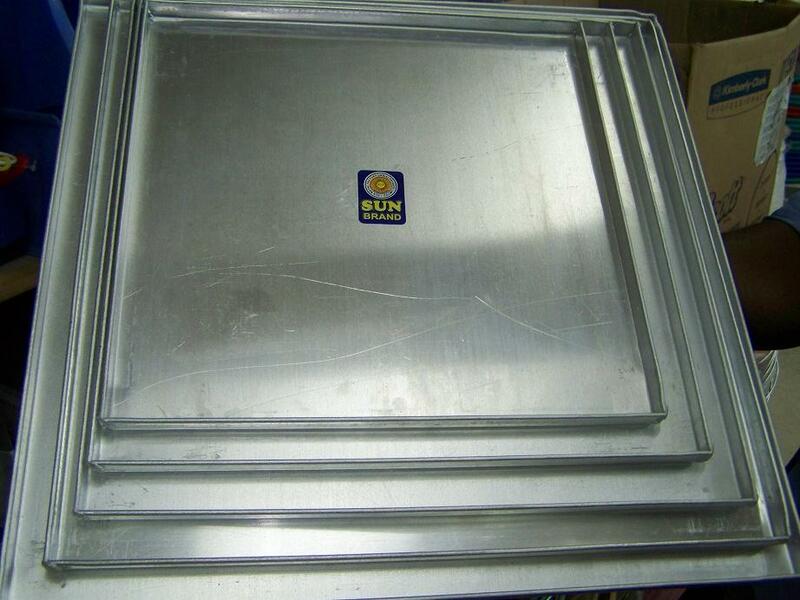 I was scanning online for a good place to buy bakeware. Glad I stumped upon your blog.